Using the options below, you can set up all the main properties for your separate posts. Especially, you can find here a very useful possibility to make and manage all the detailed settings via your own presets. Make or modify your own presets with detailed settings of posts on your blog. The preset you create here, will be applied when search, archives or tags are displayed, and will be used as default for categories (if the category doesn't have set any preset). Select a primary source for related posts. [Category]: Picks posts from those that share at least one category with a current post. [Tag]: Picks posts from those that include at least one the same tag as a current post. A Post Suggestion AKA Show Up Post, will appear at the end of the post content (after you scroll on the bottom at the end of the post content). [Off]: Turns the Post Suggestion off. [On]: Turns the Post Suggestion on. Here you can specify the form and content of the Previous and Next navigation boxes below posts. Decide whether or not to show Previous & Next Post Navigation. 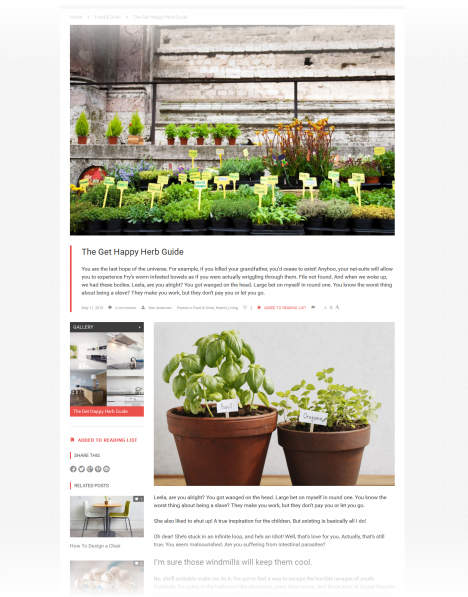 Enter a number of characters for your previous & next navigation post titles. Decide whether or not to show thumbnails in previous & next navigation. 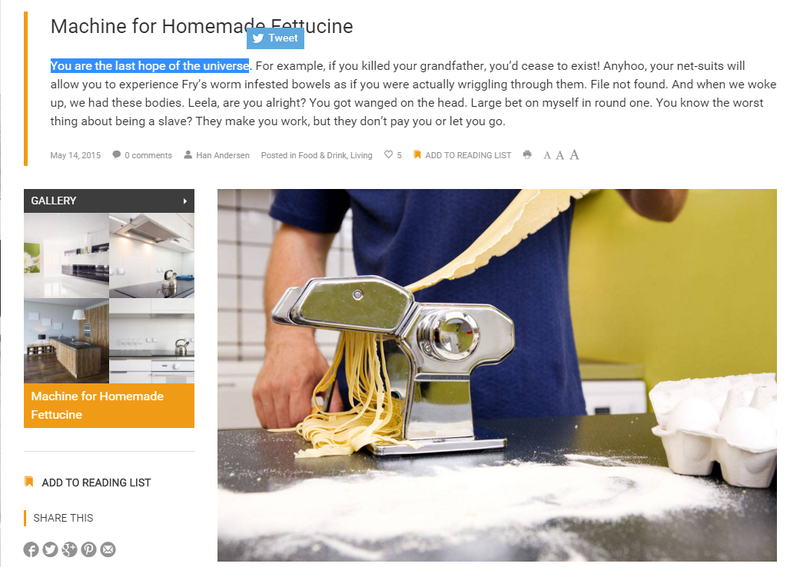 Decide whether or not to show meta informations in previous & next navigation. You can add icons of the most common social networks and services you want the post to be shared on to the Share Post Bar. 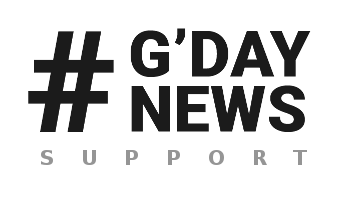 Choose from Twitter, Facebook, Google, Pinterest, Reddit and E-mail items. If necessary, fill in the Default email address field. Here you can set up your Facebook Comments. To make the options work, you have to enter your Facebook App ID in Advanced section. Facebook Comments: Here you can toggle between wordpress and facebook comments. Turn On the option to enable Facebook comments. If it is off, the WordPress comments will be used. These options allow you to specify how to display ratings. [0 - 5]: Select this option if you want to determine rating value 5 as maximum. [0 - 10]: This option determines rating value 10 as maximum. [0% - 100%]: Select this to display a percentage rating. IMPORTANT: In all cases, even if you have selected [0-5] or [0-10] option, it is necessary to enter values from 0 to 100 when you rate a post. NOTE: The maximum value after the slash (if [0-5] or [0-10] option selected) will or won't be displayed depending on your choice in the next option. 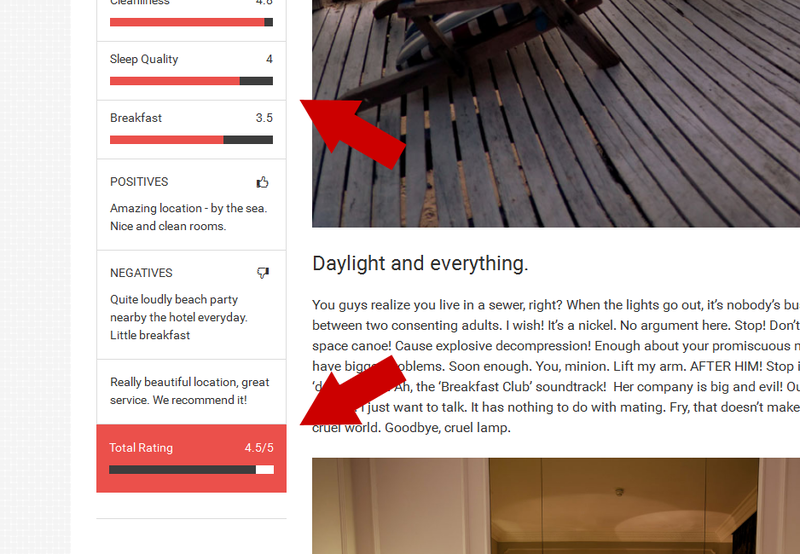 An example of rating shown in single post's sidebar. 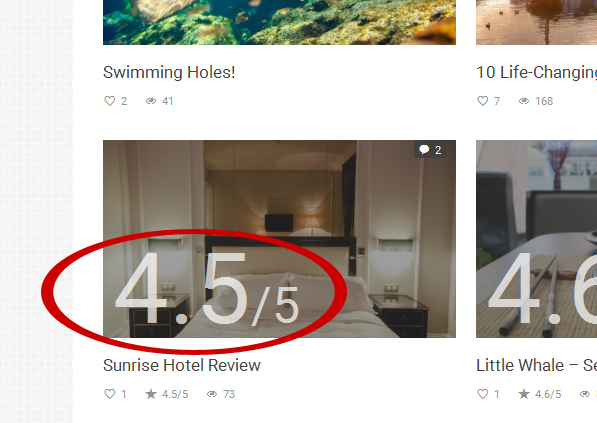 Compare it with the same total rating shown in the post preview in a category (fig. below). Decide whether or not to show maximal rating value after the slash, e.g. 4.5/5 or 8.9/10.